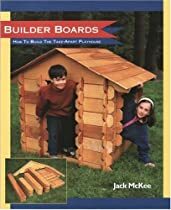 I recently ordered the book “Builder Boards”, by Jack McKee. It is available through my Amazon.com Store. You can also go directly to Amazon.com, and order it there, and I will get credit for your purchase. Thanks for your support! Timing is sometimes amazing. The day the book arrived, I read a post on Doug Stowe’s blog, Wisdom of the Hands, about these boards. If someone knows how I can center this YouTube video, please let me know. No matter what I do, I cannot center it! I am very excited about the Builder Boards, as it will be a project our granddaughters will love putting them together as houses and fairy castles, mansions and chariots – their imagination knows no boundaries! Thanks, Dave. I appreciate your comments. On the video: I have tried the “center” tag, but it does not do the job as with other objects. I have a feeling it is something within the html code; and I don’t know enough about it…Therefore, I stick with woodworking. Looking at your markup, the Youtube object is contained with paragraph tags. If you change your opening tag from to , your video will then be centered. If you look at the picture objects in your other posts, you will see that they are all contained within centered paragraph tags. I’m assuming, of course, that you have that level of control over your markup.